I grew up in Mumbai, which owing to its proximity to sea is moderately hot with high level of humidity for most parts of year. Only during the December-January, evenings in Mumbai becomes balmy and air becomes cold and nippy. My yearning for winter was particularly for some appetizing starters, piquant gravies and mouth-watering desserts that Mom used to prepare in Winters. Winters had always been my most favored time of the year, something that I would look to, year after year with similar childlike joy and happiness. Growing up, while our habits change, our likes and dislikes get altered, my excitement for the winters has persisted and has in fact multiplied manifolds. Being a romantic at heart, winters is a season that has a positive and beautiful impact on me. Besides the charming romanticism that I have come to associate with winters, I also love this season for food. Mom had gamut of winter-recipes in her repertoire that she used to pick and choose from based on our demands. She would prepare these with a great finesse and love and I would savour the smell and taste with great joy- Matar ka Nimona (Spicy Gravy prepared from Green Peas), Kachalu (Made using Potatoes), Matar ki Tahari (Rice, green peas and Lentil preparation), Urad Dal ki Khasta Kachori, Matar Pulao and not to forget Gajar Ka Halwa (Dessert prepared with Carrot). Amongst all these preparations, one of the dishes that was less common in my Mom’s kitchen was Hare Matar Ki Dal. For some unknown reasons, preferred choice of Dal with Green Peas for me and my sister, had always been Nimona. But Hare Matar Ki Dal managed to sneak on to our dinner plates on some evenings, possibly when Mom was in no mood for some elaborate labor that was required for Nimona. It required grinding green peas to a thick paste on a grinding stone. Though grinder and mixer had made its presence felt in our household by then, mother would still prefer the conventional way of grinding masalas and such pastes on Sil-Batta (grinding and flat stone). She used electric mixer only for making Dosa and Idli batter, a task that was more laborious to execute on grinding stone but something that she gleefully did in prime of her youthful days. Hare Matar Ki Dal is an authentic and traditional Dal preparation, prepared and relished with great joy in many Uttar Pradesh households during winters, that brings with it a bountiful of fresh green peas harvest. While the preparation may seem quite similar to Nimona, there are few differences as well. The Green Peas mixture for Nimona is grounded to a finer texture than Matar Ki Dal. Nimona is roasted in a pan for quite some time until it attains a light brown color and which results into gravy getting a brownish color while Matar Ki Dal is pressure cooked in a pressure cooker for faster cooking. As winter lingers on, let’s relish on these fresh Green Peas preparations for few more weeks. Make this delicious Dal preparation and enjoy it with steamed rice and/or rotis. Share your feedback with us in comment section below. Grind Chilies, Garlic and Ginger into fine paste (add 1-2 tbsp water). Grind Fresh Green Peas into a coarse paste. Do not grind into a fine paste. Ensure mixture stays coarse. We are going to cook this Dal in a Pressure Cooker. Heat 3-tbsp Mustard Oil in a Pressure Cooker. Remember few guidelines while cooking food in Mustard Oil. Heat Mustard Oil till its smoking point. When it reaches its smoking point, reduce heat and let its temperature drop. When the temperature drops, we can start cooking in this Oil. This process enhances the flavor of Mustard Oil. Add Mustard Seeds, Cumin Seeds and Asafoetida powder and mix well. Now add sliced Onions and fry until Onions become light brown in color. We have fried Onions for 5-6 mins. Now, add Turmeric Powder. Now add Green Chili, Ginger and Garlic paste. Cook this Masala to get rid of its raw smell. We have cooked masala for 2 mins. Now, add chopped Tomatoes. Cook until tomatoes become soft and mushy. Add some Salt to hasten this process and mix well. Cook covered on low heat. We have cooked Tomatoes for 5-6 mins and it has become mushy. Now add Red Chili Powder and Garam Masala Powder and cook for couple of minutes. Now add coarse paste of Green Peas. We will cook this coarse paste with masala for couple of minutes. Keep stirring this mixture. We have cooked Green Peas with masala for 3-4 minutes. Now add 2 Cups hot water. Add Salt to taste and let the Dal simmer on medium-high heat. Add some chopped Coriander leaves and mix well. On medium heat, seal the cooker and pressure cook the Dal. We have cooked Dal on medium heat for 7 minutes. Turn off the heat and let the pressure release naturally. Put the pressure cooker back on heat. Now add Aam ki Khatai (dry mango stick). Dry Mango stick can be replaced with ½ tsp dry Mango Powder. Add chopped Coriander Leaves. Cook on medium heat and meanwhile, prepare a Tadka. Heat 1-tbsp Ghee for Tadka and add dry red Chilies. Add Cumin Seeds. Pour this Tadka on Dal and mix well. Remove from heat and serve. 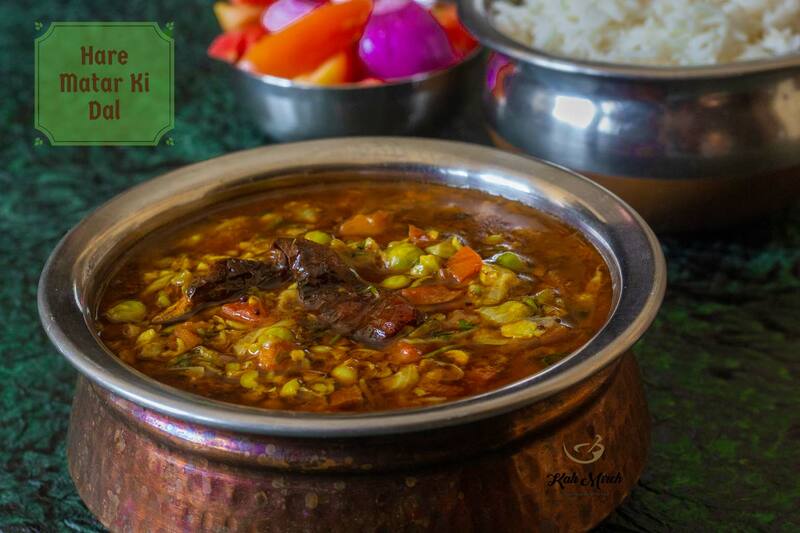 Hare Matar ki Dal can be relished with Steamed Rice and/or Rotis. In Uttar Pradesh, during winters, many dishes are made from fresh Green Peas.